A Flower That's Drunk Up Power! is the sixth episode of Wario: Master of Disguise. In this episode, Wario finds himself inside the Ancient Waterworks, where he must figure out how to stop a waterfall so he can find the third Wishstone piece. Throughout the ruins are several keys which are necessary to make progress. Wario is magically transported to the Ancient Waterworks after he successfully beats Poobah the Pharaoh in his pyramid. 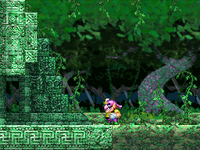 Upon entering the ruins, Goodstyle notes the huge waterfall that is crashing in the background and he suspects that something is hidden behind it, so Wario searches for a way to get rid of the waterfall. He stops the waterfall by using stone statues to clog the water that forms it, revealing a hidden room. Wario goes inside and finds the third Wishstone fragment, but a giant flower swallows it, so Wario has to fight the flower to get it back. Wario defeats the flower, but when Goodstyle tries to read the writing on the Wishstone piece, it makes no sense. Wario blames the flower for this, but then Count Cannoli comes in, demanding Goodstyle back in exchange for the location of the next Wishstone piece. After an argument, Cannoli says that he will be waiting at Sweatmore Peak if Wario ever changed his mind. The episode begins at the entrance to the ruins. Upon entering, Wario will encounter a Seed Weed and two stone slabs which fall when he goes underneath them. After that, he and Goodstyle discover a large waterfall. The pathway to the left leads to a room with two Thorn Weeds. By continuing to the left, Wario will reach a room with a purple treasure chest containing a map of the ruins. Two slabs of stone above the alcove where the chest is will fall when Wario runs under them. 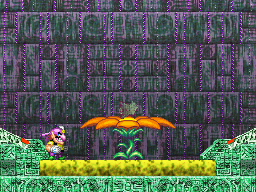 If they both fall while Wario is in the alcove, he will appear to be trapped, but the stone block above the chest is fake, and Wario can pass through it to get onto a ledge with a Thorn Weed on it. Right above the Thorn Weed is a wall that can be broken with Genius Wario's boxing glove, which leads into another room. In here, pairs of purple water droplets will create holes in the stone platforms they fall onto, and to the left are some ladders leading down to a Seed Weed. Cosmic Wario must shoot a switch to open a gate, then enter the room to the left, where he will find another Seed Weed and a purple chest containing the Floodgate Seal. The door to the right of the switch takes Wario to a tall room where he must run under the stone platforms to make them fall and create a staircase. Once at the top of the room, Dragon Wario can drop through a Semi-Solid Platform to access a red chest containing the Mighty Trucker Panda. The room to the right has three Seed Weeds and more falling stone slabs. The only way to get through the narrow passage on the far right is to let the slab near it fall, then have Arty Wario draw two blocks on top of it. The door on the far right takes Wario back to the room where the first Thorn Weeds were. Pushing these statues into the water stops the waterfall. From here, Wario can go up to find another Thorn Weed. After defeating it and destroying a red block, Wario will reach what appears to be a dead end, but there is a hidden button that Genius Wario can press. Pressing it opens the gate below. It does not stay open for long, so Wario must be quick to get past it. After that, Wario can use the Floodgate Seal to get into the next room, where he will find another Thorn Weed and more falling slabs. A hidden passage on the left leads to a pool with two Lurchins that contains the Scary Bug in Amber treasure. By continuing upward, Wario can find the North Pole Ice Cubes treasure hidden behind a fake wall and a pathway on the right with a Seed Weed on it. The path leads to a room with another Seed Weed and a pool of water with a current. Wario can reach a green chest by dropping through the platform, then changing into Captain Wario and rowing to the platform the chest is on. It contains the Cosmic Mastery Gem, which makes Cosmic Wario's lasers ricochet off of walls. Wario can use this newfound power to hit a previously out-of-reach switch in the room to spawn a ladder. It leads to an area where Wario can push a statue into the water, which stops part of the waterfall. A purple chest in the same room hidden behind a fake wall contains the Torrent Seal. It unlocks a gate in the room below, which takes Wario to a higher portion of the big waterfall room. Going down and to the left to an area with a Seed Weed and some falling stones. Wario must run past the falling stones and crawl through a hidden passage to reach a door. It leads to a room where a gate blocks Wario's path. Hitting a nearby switch with Cosmic Wario's lasers moves the gate to the lower portion of the room. The next room has numerous drops of water that dissolve the blocks beneath them, so Wario must run through it quickly. If he gets stuck in the pit with the Seed Weed in it, Arty Wario's blocks can get him out. The room to the right has a Thorn Weed, a hat switch, and a ladder. Climbing the ladder takes Wario to a door. Beyond the door is a hidden button that stops more of the waterfall. From there, Wario can climb another ladder to reach a red chest containing the Seven-Leaf Clover. The door next to the chest leads to a higher portion of the room with the hat switch in it, where he will find two moneybags. After dropping down the hole on the left, Wario will end up near the door from earlier. Wario must now return to the big waterfall room, but not before obtaining the Cataract Seal from the purple chest in the room with the laser switch. To get it, he must bounce a laser off of the angled walls and hit the switch from the other side so he can enter the lower portion of the room. After getting past two Seed Weeds, he will reach the chest. Wario approaches the gate that requires the Cataract Seal. Back in the waterfall room, Wario must jump across some crumbling platforms to reach the other side, where he will encounter a Slithervine. Right next to it is the gate that requires the Cataract Seal to open. After going through it and climbing a ladder, Wario will end up in a room with two statues: one in plain sight, and one hidden behind a fake wall. Wario must push the statue behind the fake wall until it drops down, get on the right side of it, then push it into the water. This will stop more of the waterfall. The nearby door leads to a room with two Thorn Weeds. On the bottom right corner is a red chest containing the Booby-Trapped Magnet Car. Water drops will dissolve the block platforms in this room, so Wario must get through it quickly to be able to crawl through the narrow passage on the left and reach the door beyond it. If there is still one block next to the narrow passage, one of Arty Wario's block can get him through, otherwise he must reset the room by going through the door he came in and returning. The door takes Wario to an area with a blue block. He must push the block to the left, then push the statue behind the fake wall above to the right until it falls in the water. This will stop the waterfall completely, revealing the entrance to the boss's room. A hidden passage to the left leads back to where the first statue was, allowing Wario to easily return to the big waterfall room. Wario must now go back to the room to the right of where the Floodgate Seal was. After letting the dripping water dissolve the first two sets of block platforms, Dragon Wario must destroy the red blocks in the way so the drops can dissolve the third set. This opens a path to a laser switch, which spawns a ladder leading to a moneybag and a hat switch. The path on the right leads to a large room with two Thorn Weeds and many laser switches that spawns white platforms that drop when stepped on. By using the platforms, Wario can get to a ledge on the right, where he will find the Starfish Ladybug treasure. By going down and to the left, Wario will find another large room, where he will encounter five Seed Weeds. 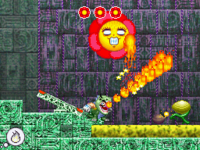 The bottom half of this room is filled with water and has three Lurchins guarding a red chest containing the Vengeful Robot Controller, but it cannot be accessed without Captain Wario's upgrade. The path on the left leads to an area with more lasers that spawn temporary platforms. 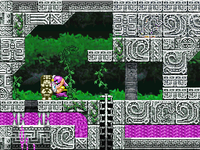 Wario can use them to reach a purple chest containing the Waterfall Basin Seal, which is needed to reach the boss room. The boss battle against Ka-Bloom! Back in the Thorn Weed room, Wario can use the white platforms to get over the running water and the stack of blue blocks on the right. There is a ladder leading back to the top of the room and a path leading to the right. The next room has more white platforms over running water which Wario must jump across. Halfway through, he will encounter a Thorn Weed. At the far right end, Wario will find a room with a seesaw. By turning into Captain Wario and rowing against the current, he will reach a moneybag and a red chest containing the Fully Automated Pinwheel. By using the seesaw, Wario can reach the upper right section of the room, where he will find a hat switch, two moneybags, a Thorn Weed, and two Seed Weeds. On the upper left is a path leading to the left, which will take Wario to the gate where the Waterfall Basin Seal is used. After opening it, he will be in a lower portion of the big waterfall room. Wario must use a seesaw to get to the entrance to the boss's room. A red chest can be seen near the entrance partially obscured by a tree branch, which can be reached with Arty Wario's blocks. It contains the Fanny Armor. To the right is a hidden passage leading to two moneybags and another red chest, which holds the Brilliant Bug. 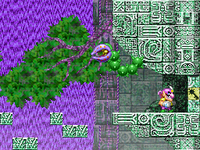 Upon entering the boss room, Wario and Goodstyle will discover the third Wishstone piece on top of a flower, but the flower eats it, forcing Wario to fight the flower to get it back. * - Not counting additional Seed Weeds created through reproduction or spawned by Ka-Bloom! during its boss battle. A Treasure Pest will appear in place of one of the red chests, making it unobtainable on the first run. Ancient Waterworks Map In the room to the left of where the first Thorn Weeds are. Floodgate Seal In the room to the left of the tall room with the red blocks and dripping water. Mighty Trucker Panda $206 At the bottom-left corner of the wide room to the left of the boss room, accessed from the room to the left by using Dragon Wario. Scary Bug in Amber $25,688 Obtained by using Arty Wario to enter a hidden passage in the room beyond where the Floodgate Seal is used. North Pole Ice Cubes $20 Hidden behind a fake wall in the upper-right section of the room beyond where the Floodgate Seal is used. Cosmic Mastery Gem In the room to the right of where the North Pole Ice Cubes are, obtained by dropping down with Dragon Wario then using Captain Wario to row to the ledge. Young Socialite's Scarf $89 Replaces the Cosmic Mastery Gem during subsequent runs of the episode. Torrent Seal In the uppermost room hidden behind a fake wall where the first portion of the waterfall is stopped. Seven-Leaf Clover $105 On the far right of the uppermost room. Cataract Seal In the room directly above the one where the Mighty Trucker Panda is, accessed by using Cosmic Wario's reflecting laser to hit the switch from the right side of the gate. Booby-Trapped Magnet Car $280 In the room beyond the middle door of the waterfall source room. Starfish Ladybug $190 In the upper-right section of the room southwest of the waterfall area, accessed by hitting switches with Cosmic Wario and hopping across the white platforms that appear. Vengeful Robot Controller $1,052 In the room southwest of the one where the Starfish Ladybug is. Unobtainable on the first run due to requiring Captain Wario's upgrade. Waterfall Basin Seal In the room to the left of where the Vengeful Robot Controller is, obtained by using Cosmic Wario to hit switches and make platforms appear. Fully Automated Pinwheel $380 In the bottom-right corner of the map, accessed by using Captain Wario to row against the current. Fanny Armor $6,320 On a ledge near the boss door, accessible by using Arty Wario's blocks. Brilliant Bug $64 In a room accessed through a hidden passage to the right of the boss door. This page was last edited on March 16, 2019, at 01:07.